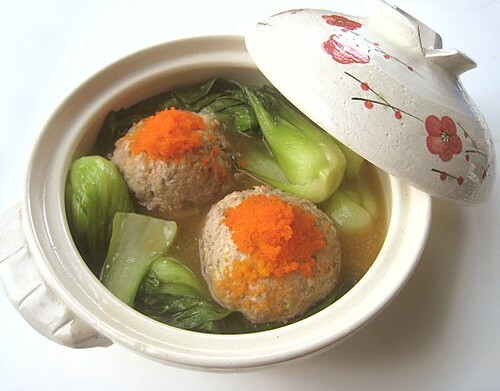 Lion's Head Meatballs are known far and wide, being on the menu of most Chinese restaurants, in China and abroad, regardless of the restaurant's regional affliations. Originally, the dish has its roots in Jiangsu cuisine and this is another fine example of the culinary tradition's subtle sophistication and its insistence on the freshest and choicest ingredients. 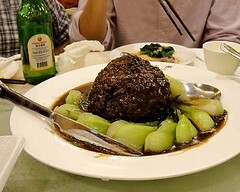 For more information on Jiangsu cuisine, visit our Wuxi Pork Spareribs post. This is a very simple dish to make, but when the dish is this simple, there's nowhere to hide. 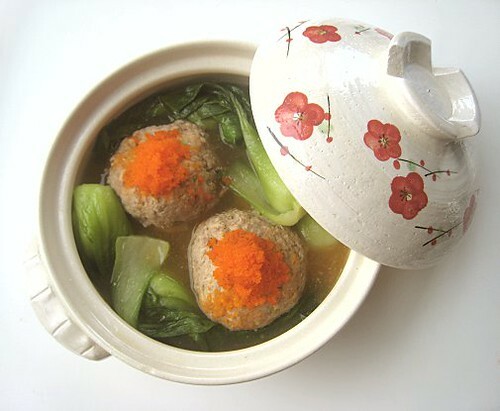 I can imagine the most perfect rendition of Supreme Lion's Head Meatballs, having a Jiangsu chef make this with fresh-picked bok choy from the garden, meat from a pig that's just been slaughtered, and crab meat and roe from crabs trapped that morning. He or she will then cook the meatballs in a chicken stock, made from free-range chicken of course, that has been simmering a whole day. Back to reality, back in reality, I'm afraid we lazypeople, made lazier by our modern "conveniences" unfortunately, have to allow ourselves some shortcuts. 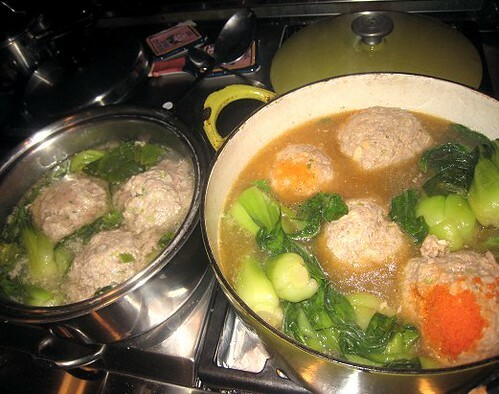 Oh well, since I've never tried the Supreme Lion's Head Meatballs of my fantasy, I think the version that we've come up with here is still pretty darn good, if I may so myself. 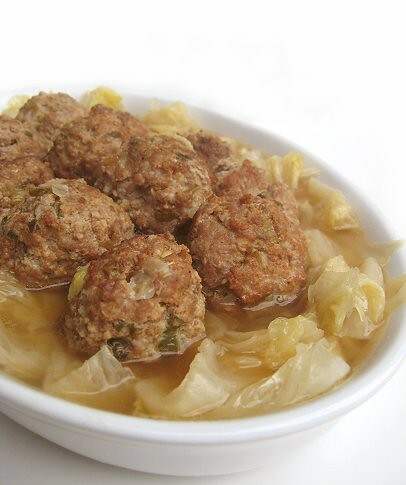 And oh, just to be clear, we're calling this dish "Supreme Lion's Head Meatballs" to differentiate this dish from the all-pork genre of lion's head meatballs. It's just a moniker, not an indication of anything else. 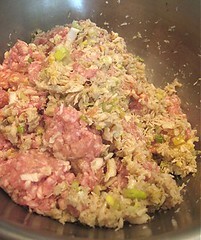 Ground pork, crabmeat, green onions, and some seasonings. That's it! Look at JS' hands of fury! I used a very basic homemade chicken stock for this dish, because I had three carcasses of chicken that were undressed but had nowhere to go except in a pot with water and a piece of crushed ginger. You can use store-bought chicken stock, but do make sure that the chicken stock is a good brand because in this simple preparation, you will most likely taste any off-flavours (e.g. "tinny", preservatives, etc.). I've read that this dish is often prepared with crab roe. Since we weren't using fresh crabs for this dish, we have no access to their roe. 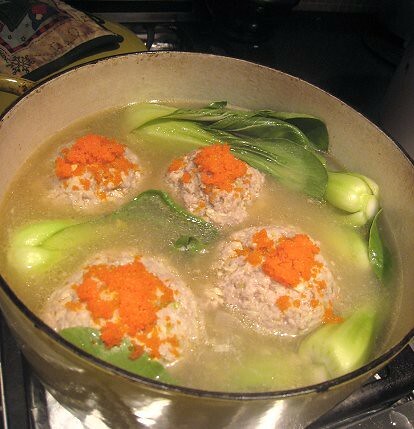 We had a roe-like thing sitting in our freezer, some masago, and that is what we used to garnish the lion's heads. 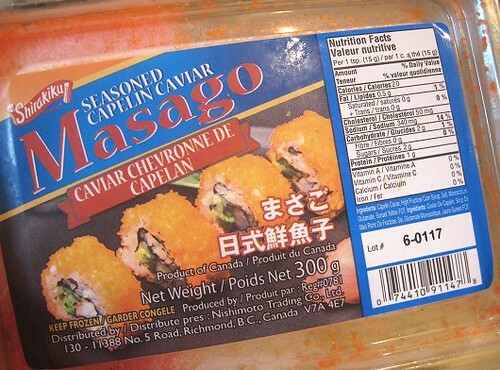 You don't have to use masago though and the dish doesn't suffer for lack of it. 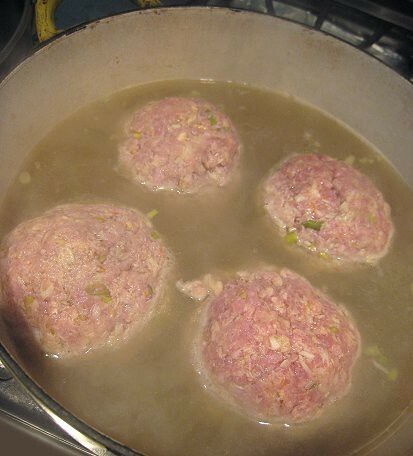 As you can see, 2 pounds of pork plus 1 pound of crabmeat make 4 big meatballs! 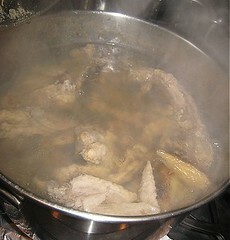 JS simply plopped them into the simmering chicken stock. We had to turn them over sometime during cooking because they were so big that the stock didn't fully cover them. After a while, the bok choy went in. I personally think the "Supreme" version of Lion's Head is indeed superior to the all-pork lion's heads, because the crab adds such a different dimension of savoury sweetness to the meatballs. The taste is, in the words of those old Japanese Iron Chef critics, "subtle yet profound." It is a very light taste, very clean flavours, and yet, quite soul-satisfying. 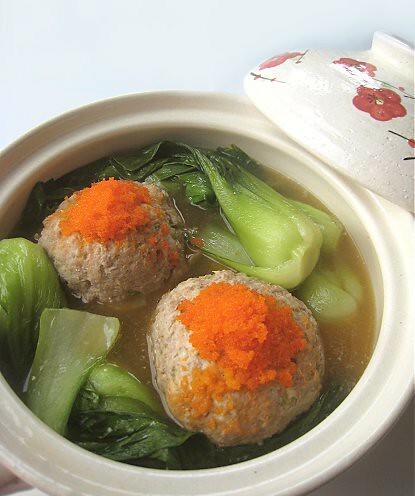 We've had a version of Supreme Lion's Head Meatballs at Suhang. Like the recipe below, this was served in a light broth, with some more crab meat on top of each head. We've also made an all-pork version, but smaller sized, that we've called "Little Cubby Heads". They were also served in broth. 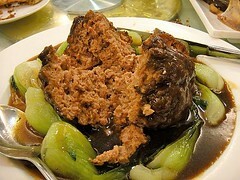 There are also Lion's Head Meatball dishes that are not in soup but rather braised in a brown sauce. This is what we had at our 8GTCC dinner at Shanghai Village. 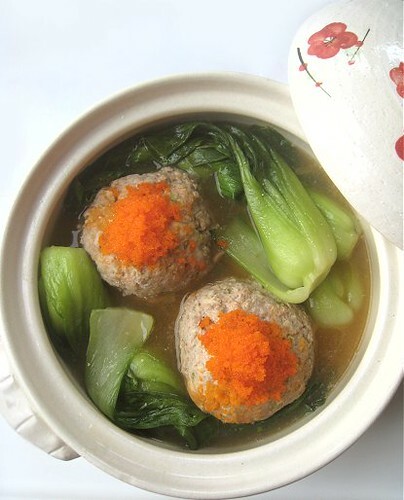 For the record, I also liked Chef Ming's Lion's Head Meatball dish at Shanghai Village. 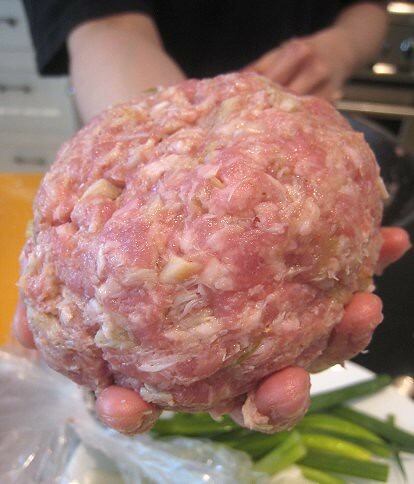 Mix pork, crab meat, and other meatball ingredients together well. Form into big balls (4" to 6" in diameter). Heat chicken stock in a pot, letting it come to a boil. Gently place your lion's heads into the pot and put on simmer for approximately an hour. Add vegetables towards the end and cook until desired doneness. Garnish lion's heads with masago or tobiko at this time, if using. Those are some big meatballs! Does one person eat one? I tried making this once but without the crab meat. Looks and sounds really delicious! Love the name of this dish! Also interesting I have never had a pork and crab combo. Phillips? Phillips is a well know seafood restaurant in Baltimore Maryland. I am from there. Can you really get their products here? It wasn't till the last year or two or so that you could buy products withe their name on it in grocery stores in Maryland (I am from there and and here in Van. for Uni). This always looks so impressive, seen it all over the internet but never in any of the restaurants here. 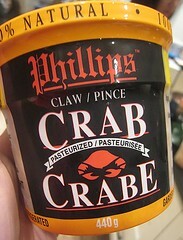 Love the addition of crabmeat to yours - it really does sound supreme. Yeah, they're HUUUUUGE. I think 2 people per meatball is a good amount. 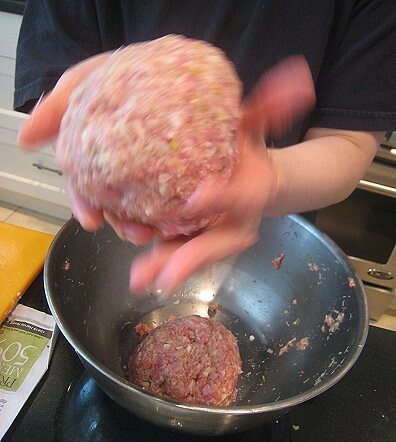 So, the recipe makes 4 big meatballs, and it should serve 8 people. Maybe more, actually, if there are other dishes on the table. Plus rice, of course. We did a just-pork one too! Thanks. We thought giving it the "Supreme" moniker would make it sound more "Chinese". Teehee. Pork and shrimp is a very common combination, so pork and crab is not too far a stretch from that. Oh, I'm not sure if these two Phillipses are related. We bought this crabmeat from Costco.